EZLynx has been working diligently to address performance and data consistency issues in Accounting. 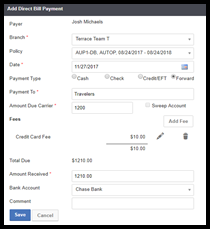 The branch field on the Add Deposit screen is again defaulted. This was an inadvertent change in the previous release. Customer statements will show the correct balances for the aging buckets and total. We have more improvements to customer statements planned for future releases. Customer statements can be printed for customers who have no agency bill invoices. The receipt overview and printed receipts now show policy information for both agency bill and direct bill payments. You can now write off unapplied amounts for receipts in branches. The Refund Unapplied screen now allows sorting, searching, and has pages to ensure you can see every receipt with an unapplied balance. You can now select negative unapplied balances on receipts to offset other refunds on checks. Refunds on credit invoices in branches can be added to checks at either the branch or the parent organization. The invoice due date is now properly calculated for branches. eSignature, Auto ID cards, and Sales Center have all been upgraded to help bring your agency to the next level. Let’s see what’s new! This release contains some exciting new features for EZLynx eSignature. 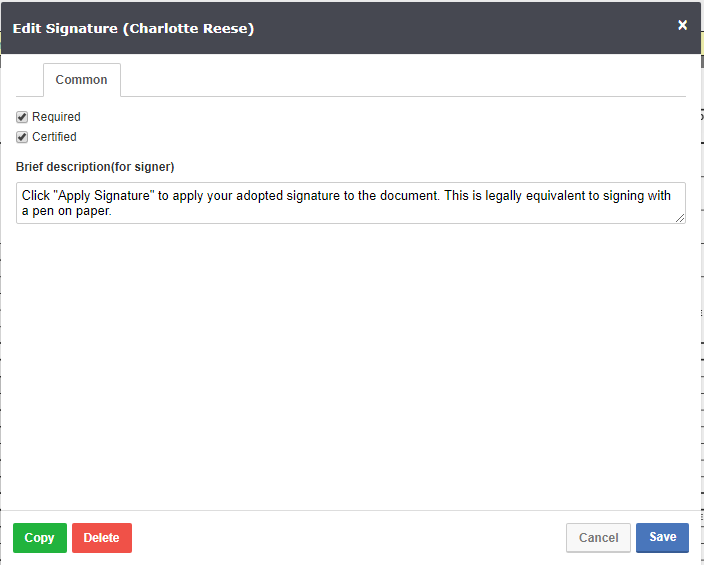 There are now four new items you have requested that you can apply to your documents when creating eSignature envelopes. This provides you with greater versatility when creating your envelopes. We have also implemented a fix for resending pending envelopes. In the past, you would lose the envelope’s history when you resent a pending envelope. That is not the case anymore. So, let’s jump in, and see what’s new! For the most part, the eSignature envelope workflow is the same; however, you will see a new user interface and four new signature items. The first thing to point out is the new look and feel of the left menu area. We have added icons next to each signature item. These also appear when you add an item to the document. We have removed the old dropdowns for determining whether the signer’s signature or initials should be written with a mouse or typed. If you require the signer to sign their name or initial via a mouse or stylist, simply select Signature or Intitals. To have the signer type this information, select Typed Signature or Typed Initials. 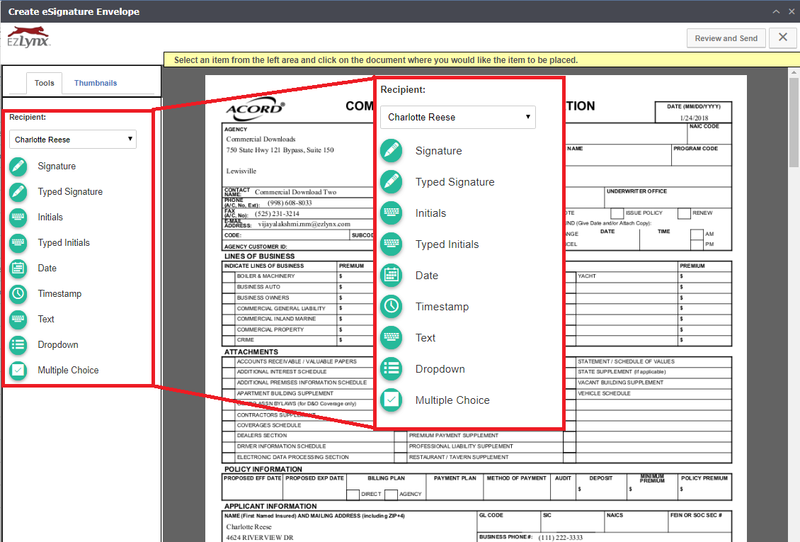 To move signature items to the document, select the item from the left menu, and click on the document where you would like to position it. Once you add a signature item to the document, you can now edit the signature item. The new edit modal automatically opens for dropdown and multiple Choice items. For other signature items, select Edit in the signature item to open the edit modal. Each edit modal will state the name of the signature item and the signer it is applied to as demonstrated to the right. Determine if it is Required for the signer. It is mandatory for the signer to provide input for the item. Choose to Certify the item. This option renders meta-data in its frame including the JotblockID, the IP address where signing occurred, and universal time (UTC) timestamp. Add a description for the signer. This appears when the signer reaches the signature item during the signing process. Copy or Delete the item. 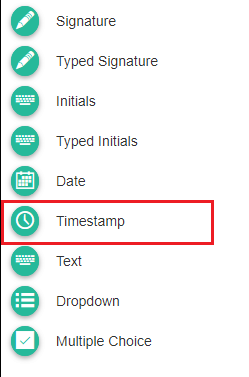 Timestamp adds a timestamp to your document after each signer completes the signing process. Because the system automatically applies this item, we make it required. 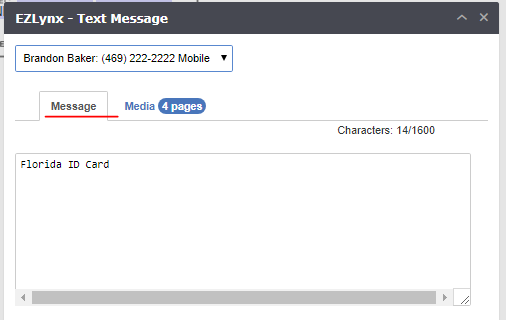 The Text option allows you to add a text field to the document, so the signer can type a message. The text item is adjustable in size, but the signer is limited in the length of the message they can type based on the size for the text field in the document. In the image to the right, notice that we have resized the Text field to make it larger. This permits the signer to add additional text in the field. To resize, click on the item, and drag the corners to resize the item’s field. When the signer is entering their text, we provide them with a warning if they exceed the maximum character length for the field. The new Dropdown signature item allows you to add a series of options that the signer(s) can interact with. 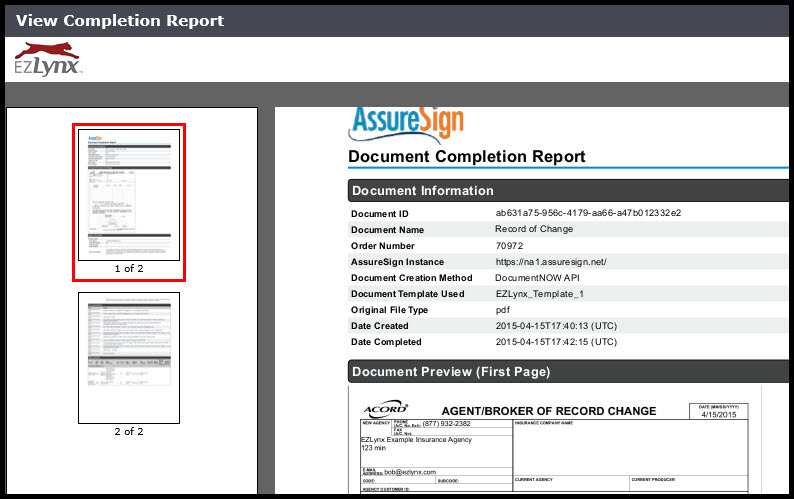 Display Text – this is the wording the user will see during the signing process with AssureSign. Value to Save – this is the wording that will be saved on the document when the signer has completed the signing process. 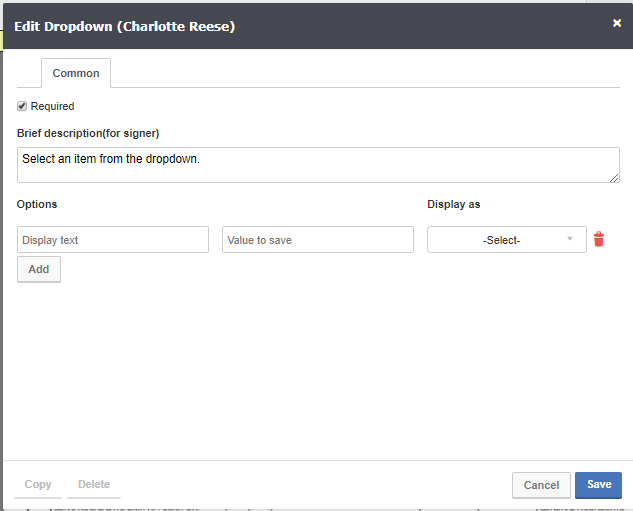 Display As – this is the image that is applied to the document when the user selects a dropdown option during the signing process with AssureSign. Add multiple lines/options to your dropdown – click Add under the Display Text column. Multiple Choice is a great addition that allows you to add multiple choice boxes to your documents. 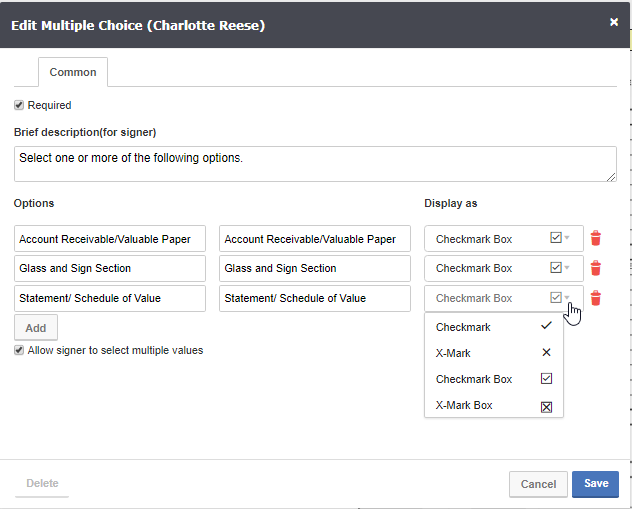 For example, if you want the signer to check multiple items in your document, maybe different coverage options, Multiple Choice gives you that functionality. In the image above, we added three multiple choice boxes. To add more, click Add. Please note that you are limited on the Display As options. 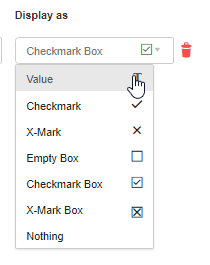 You can select: Checkmark, X-Mark, Checkmark Box, or X-Mark Box. Also, there is an option to allow the signer to select multiple values. This option is selected by default. When selected, the signer has the ability to select multiple items during the signing process. Once all values are added, click Save, and land on the document overview. Notice that boxes have been added to the document. If you click on the boxes, you will see a darkened border around the items to indicate which boxes are grouped together. To see the Save to Value, hover over the box to display a message as shown here. Now, when you resend a pending envelope, the system resends it and retains the envelope’s history. 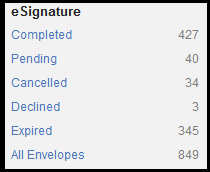 If you resend a pending envelope with more than one signer, the system resends the eSignature envelope to the next pending signer. We are also adding an entry in the envelope’s history to record who received the resent envelope. To access, click the blue Pending status for the envelope you resent. There are screen changes for Professional Liability, Directors & Officers and Errors & Omissions. We have also improved the Garage & Dealers Applicant Policy Entry Screens. All these changes are to prepare for our Commercial Package Applicant Policy Entry screen that is coming soon! When you create a Professional Liability application or policy, the Professional Liability tab no longer exists, so that there is a streamlined process that is consistent throughout the policy entry screens. Another enhancement is that No. of Members and Managers remains on the screen for any chosen Business Entity. On the Financial/Ownership Structure, when you answer Yes to an Outside Auditor, the system dynamically displays the following additional questions. 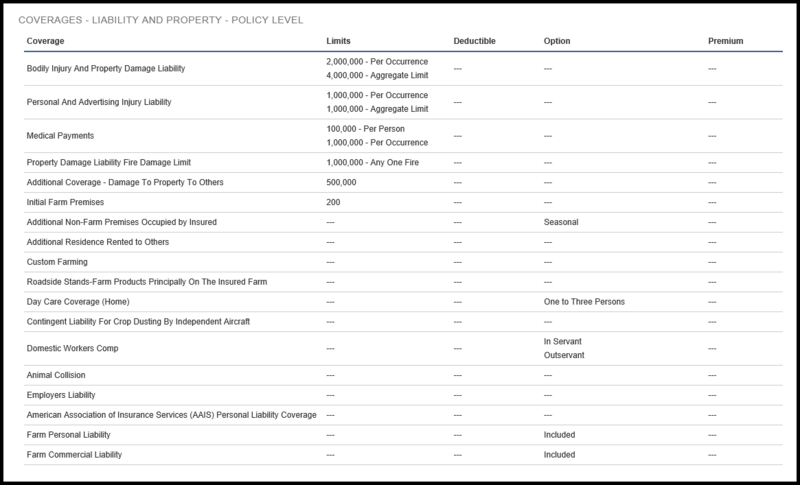 The Coverage Tab now has drop-downs for easy selection and, if you want, you can also add the Liability Limits, which will flow to your Policy Summary. 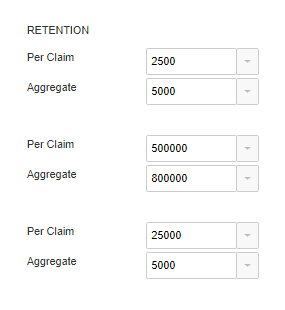 Under the Coverages Tab, Retention Limits offer drop-downs to improve data entry. Before this release, you could add an unlimited number of Coverage rows. Now, following the ACORD 807 for Directors & Officers, you can add up to two additional rows of Coverage. When you answer YES to the applicant having a separate Defense Costs, a field displays to enter the separate Defense Costs limit. We decreased the clutter on the Coverages Tab to make the screen easier to read. Garage & Dealers Applicant Policy Entry screens received a clean-up to make it easier to understand and read. On the Coverage tab, the look and feel of the Garage & Dealers is better with improved field labels and the boxes are closer together which makes things easier to identify. Corrected data mappings for Garage & Dealers to ACORD Forms. 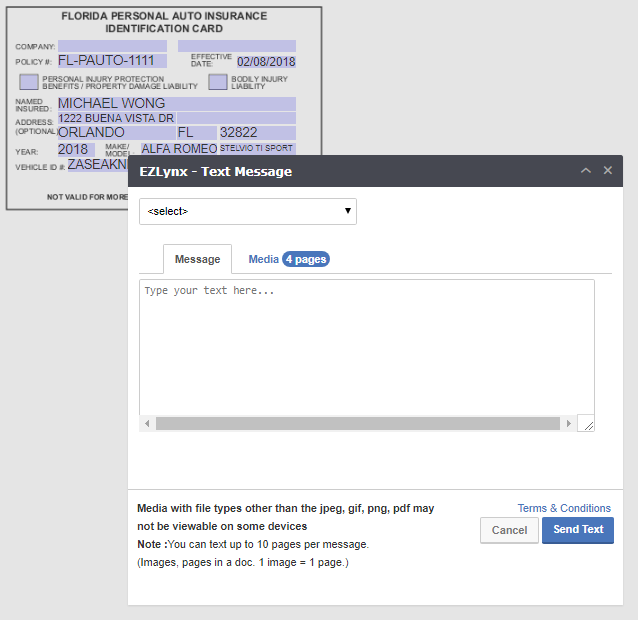 You can now Text an Auto ID Card for either Personal or Commercial Auto policies. With our enhanced functionality, you can easily select one vehicle to create a single ID Card. When you locate your policy and choose ID Card, if the policy has more than one vehicle, you can check the box to select a single vehicle. Notice after clicking Select All Vehicles, it changes to Deselect All Vehicles which unchecks the boxes of the selected vehicles. Hint: Checking the box under Select All Vehicles will check all the boxes. Unchecking the box under Deselect All Vehicles will uncheck the boxes. 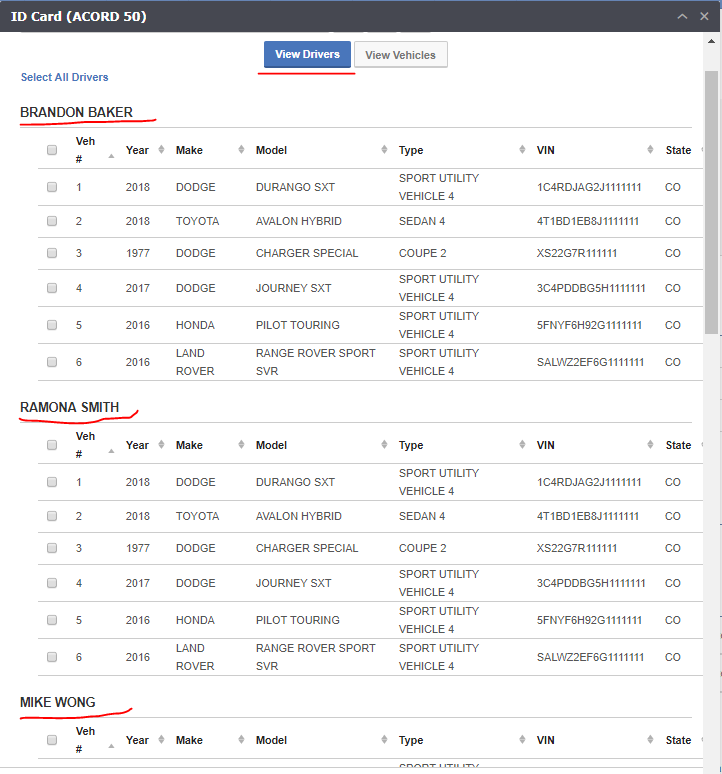 You filter by the vehicle’s Year, Make, or Model to search through a list of vehicles, to narrow your list. 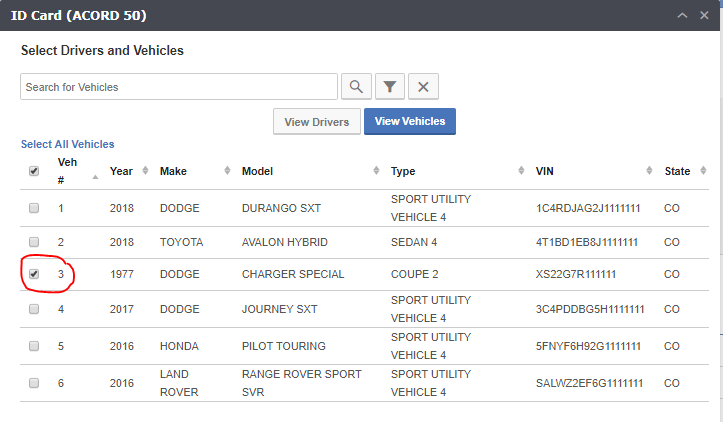 You can also filter a list of vehicles by Year, Makes, Models, and VINS. To create an ID Card with a single vehicle, select the View Vehicles button. It presents all vehicles listed on the policy. After creating your first ID Card, the system will remember your chosen view. For example, if you chose View Drivers, then when you return to create your next ID Card, the system defaults to your last choice. After clicking Preview, the Pdf Viewer opens in a new window displaying the policies ID Card. If everything looks good, then press the Text icon, and click Save for the EZLynx – Text Message popup. Click the drop down to select the customer and their mobile number. If you don’t see a mobile number, then go to the Details screen to either update or add your customer’s mobile number. 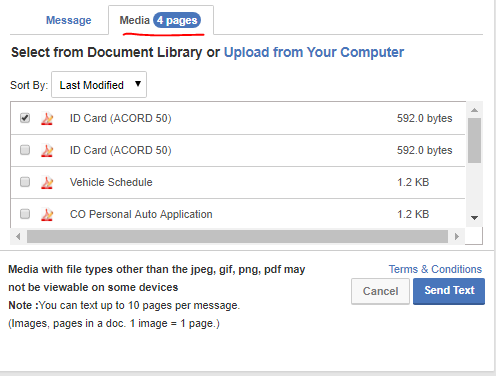 On the Media Tab, a check box preselects the ID Card and counts the number of pages within the document. This is indicated by “4 pages” highlighted in blue. Click the Send Text button. Some important things to note about Texting documents. You will now be able to split opportunities that have more than one LOB associated to them. We have implemented new automation for Sales Center opportunities, exciting new functionality for the workspace with respect to editing opportunities, new functionality for Sales Center Prospecting and new controls allowing you to determine which events will or will not be automated in Sales Center. There are a lot of great changes for Sales Center 2.0 in this release, so let’s have a look! Sales Center Prospecting is a great add-on to Sales Center that allows you qualify leads prior to pushing them into EZLynx. We allow you to upload lead lists from which you can create email campaigns to solicit business. Once you have qualified a lead, you can create an opportunity which will push the respective prospect into EZLynx as an applicant and create an opportunity for them in Sales Center. Sales Center Prospecting is another great tool designed to help you more accurately manage your sales pipeline. If you would like more information, please feel free to contact Pete Holcomb at [email protected]. For those of you who have worked with Sales Center Prospecting, you’ll appreciate this next enhancement. 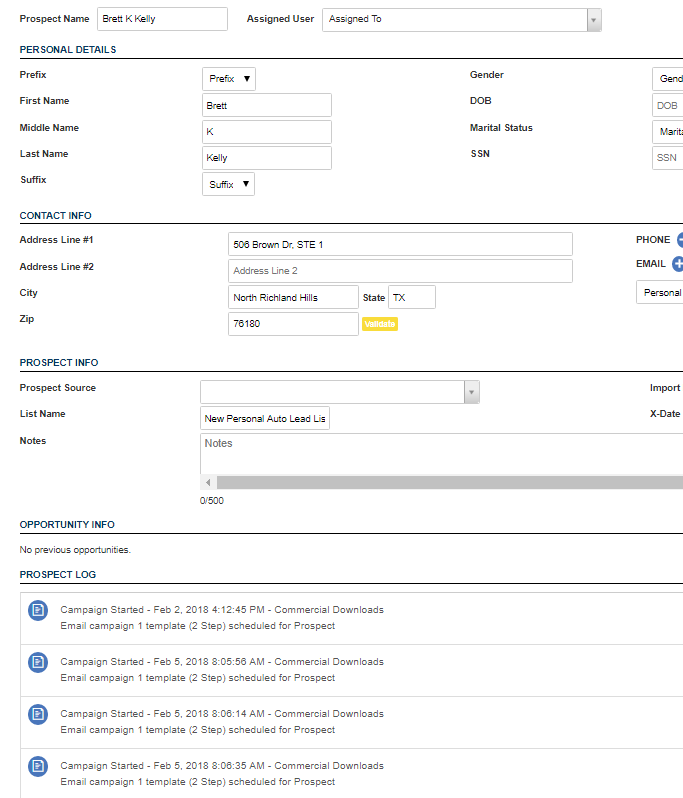 With this release, we are now giving you the ability to create email campaigns for prospects. To send an email in prospecting, select the prospect lead list you would like to work, then select the individuals in the list you want to email. The system checks to make sure the email addresses for the selected leads are not on the suppression list. If any are on the suppression list, you will be notified by the system that emails cannot be sent to those particular prospects. With the ability to email prospects, we have also introduced a new automated event. If there are any running email campaigns at the time an opportunity is created for the prospect, the system will automatically cancel them. We do this in order to remove the prospect from the prospecting email campaign, so they will not receive emails after they are converted to an applicant in EZLynx. We have also added a new Prospect System Log. This will log events that take place for the individual when they are a prospect. You can see the log in two places in the system. 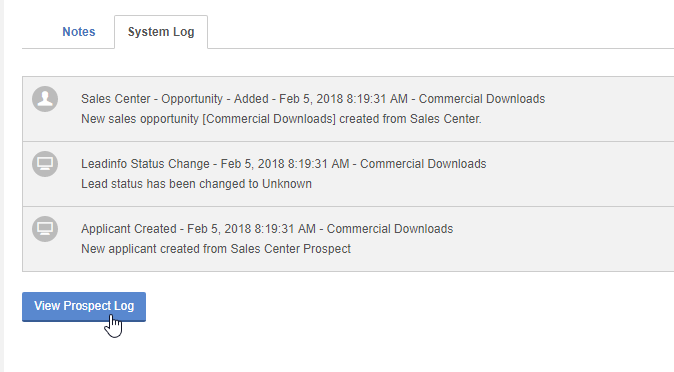 On each prospect in Sales Center Prospecting, you will see a new section at the bottom of their information area titled Prospect Log. Once a prospect is converted to an applicant, you will now see a new section at the bottom on the applicant’s system log. To view the prospect log, simply click on View Prospect Log. 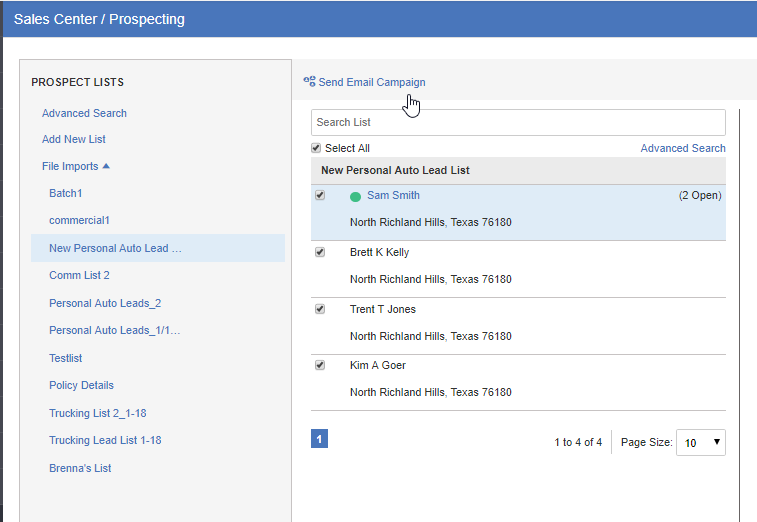 With this release, you now have the ability to remove lead lists from Sales Center Prospecting. In the past, when you uploaded a lead list, it was permanently held in the prospect list section. This presents a problem if you are wanting to keep your prospecting area clear of unneeded information. We have now added a trashcan next to each lead list, so you can easily remove lists from Prospecting. This will make it easier for you to manage your information in Sales Center Prospecting. 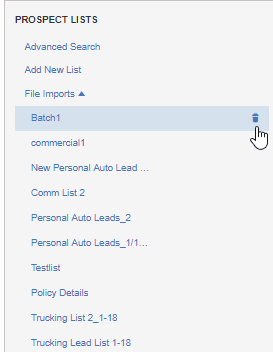 When importing a lead list into prospecting, you will now see a loading indicator appear in the Import Prospect List modal once you have chosen to import a valid lead list. This enhancement indicates the system is processing the list and clears up any ambiguity. With this release and the prior December release, we introduced a few new automated events to Sales Center. In order to provide you with greater control, we have added three new settings to the Sales Center settings area. These will allow you to determine whether or not you want the automated events to happen for your agency. Create New Opportunities – this setting allows you to control whether or not a new opportunity is created each time a new applicant is added in EZLynx. 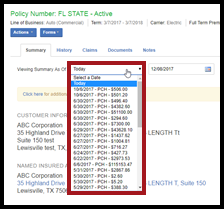 Create Opportunities During Quoting – this setting allows you to control whether or not a new opportunity is created when the user quotes a home and/or auto LOB that is not currently part of an active policy. It also controls if the quote is associated to the respective opportunity and automatically updates its status in Sales Center. 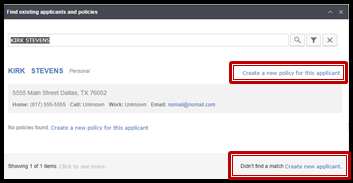 Link Policies to Opportunities – this setting allows you to control whether or not manually entered or downloaded policies are automatically associated to their respective opportunity. It also controls the automatic closing of the opportunity once the association has been made. When you click this button, the new Split Opportunity pane will appear. This new feature introduces Drag & Drop functionality that makes it easy for you to rearrange the LOBs in your opportunity. Notice that there are two sections in the new Split Opportunity panes: Existing Opportunity and New Opportunity. Each time you drag a LOB into a ‘New Opportunity’ container, the system is creating a brand new opportunity. Because of this, your notes and discussion will remain with the Existing Opportunity. We recommend the following workflow when splitting an opportunity. For the LOBs you need to close, drag those LOBs to the New Opportunity container. Keep the LOBs you aren’t closing in the Existing Opportunity container. This allows you to keep the discussion associated to the open opportunity. 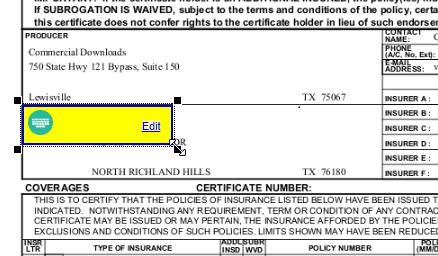 In the screenshot above, we are closing the Homeowners but the Auto (Personal) is remaining open. The discussion will remain with the Auto and the opportunity being created for the Homeowners will not have a discussion associated (you will need to create a new discussion for this LOB after the split). We will allow you to create as many ‘New Opportunities’ as you wish, provided there is an LOB in each of the New Opportunity containers. When ready, simply add a note and save. This will prompt you to confirm that you want to split the opportunity. After you have split the opportunity, you will now see the new opportunities created for the respective applicant. Simply select the one you want to edit and proceed as normal from there. When you edit an opportunity in the workspace, now the Sales Center pipeline headers are in the Edit Opportunity pane. This allows you to click the column header where you wish to move the opportunity, without having to navigate the Opportunity Status dropdown. We have also made it easier for you to update an opportunity when viewing the opportunity’s detailed view. Now when you access the detailed view of an opportunity, the headers are clickable. 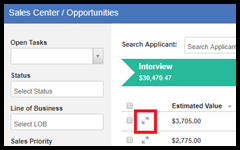 So in the image above we are able to see that the opportunity is in the Interview column. If you want to move it to the Presentation column, then all you need to do is click on the Presentation header. This will move the opportunity and change its status to Presentation. You can always make the opportunity’s status more granular by selecting one of the Presentation statuses in the status dropdown should you feel the need to do so. When closing an opportunity, you currently have the ability to create a new opportunity for the next x-date. If you choose to do so, we are now providing a new Opportunity Source called Sales Center X-Date. This allows you to see where the opportunity came from when it resurfaces in your sales pipeline. With this release we have added another layer of automation to Sales Center 2.0. When a policy is downloaded or manually entered into EZLynx, the system checks to see if there are any open opportunities associated to the respective applicant for the policy’s LOB. If there is, then the system will automatically associate the policy with the opportunity and then finalize it with the correct carrier and premium information. Also, once the opportunity is finalized and closed, we will remove it from Sales Center. You will be able to see it in the Sales Center reports the following day. When you are in the opportunity detailed view, there is now a new preferred contact action item for your opportunities. To select a preferred contact method for the opportunity, click on the green heart next to the contact methods listed. This lets you know the best way to contact the opportunity’s applicant. 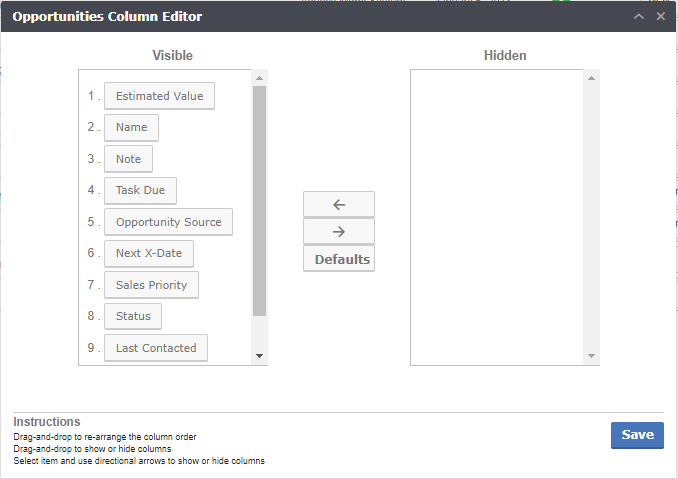 We now allow you to edit the columns in the Sales Center table. In the top right corner you will now see a new button called Edit Column. Selecting this will open the Opportunities Column Editor. When you first access the editor, you will see that all columns are visible. If you are not happy with the changes you have made, we have provided you with a Default button that will allow you to revert the column changes you have made and sets the table back to its defaults. Finally, with the release we have also issued a few bug fixes. Below is a list of the fixes. The 4.17.12 release has many valuable enhancements and streamlined workflows. At EZLynx, customer feedback drives the improvements we work to provide in our monthly releases, and this month’s release responds to many agent requests. To have your agency set up with Beta features, please complete this EZLynx Beta Request Form. We will contact you shortly afterward. With this release, you can now create a new applicant and/or a new policy for unmatched items in your commission statements. This allows you to save time and remain in the workflow of finalizing your commission statement without leaving to create new applicants and policies. Now, it’s even easier to filter commission statements by unmatched, matched or all items in the statement. Difficulty separating matched and unmatched line items in your commission statements is a thing of the past. We have added a new filter dropdown that allows you to filter the commission line items by either: All, Matched or Unmatched. By default it is set to ‘All.’ To change the results, simply select the filter to apply. Selecting a specific filter will update the data on the list and return only those Match Status results. Introducing: the ability to add new applicants and/or new policies for unmatched commission line items. This enhancement alleviates the need to exit the commission statement to create a new applicant and/or new policy, in order to match commission line items. Select MATCH for any unmatched commission line item. The system searches for an existing match to any applicant/policy number. If none exists, you have the option Create New Applicant/Policy. Either create a new applicant or create a new policy for an existing applicant. With Create a New Applicant, you will create either a Personal or Commercial Applicant. 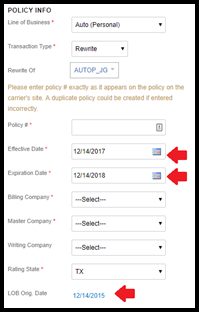 Skip this step if you already have an existing applicant by clicking Create a New Policy for this Applicant. After creating the new applicant, create the New Policy. If there is a potential policy, choose the SELECT option, and you will be able to merge the commission statement line item with the existing policy in EZLynx. 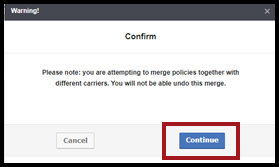 If you MERGE a commission line item with an existing policy, you will receive a warning that you need to confirm prior to the system processing your request. EZLynx is excited to introduce the Change Request feature aimed at simplifying the change request process for agents. EZLynx empowers your agency to cater to your consumer’s policy change requests more efficiently and position your agents as trusted advisors in front of the consumers. As part of this feature, agencies will be able to create change requests within EZLynx, submit to carriers or insureds, utilize workspace and tools to do follow ups, and verify the accuracy of change request once processed. Initially we enabled this feature for only Commercial Auto line of business. With this release, we are excited to announce that this feature will be available for additional lines of business which includes Personal Auto, Commercial General Liability, Business Owners Policy, Commercial Property, Workers Compensation, Homeowners, Dwelling Fire, Commercial Umbrella, Garage and Dealers, Professional Liability, Directors & Officers, Errors & Omissions, Commercial Crime, Farm Owners. 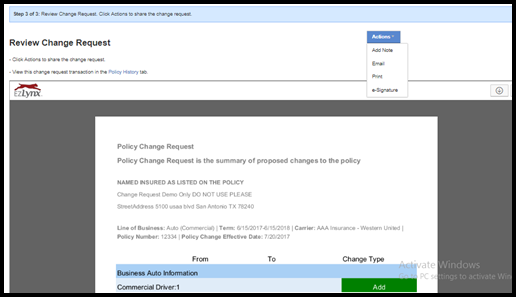 Utilize policy entry screens to create change request & preview changes before saving them. Create Change Request Memo to communicate proposed changes to the policy. Email change request, use EZLynx eSignature for insureds’ signatures, and create notes and tasks to follow up on change request. Generate Commercial Change Request ACORD 175, and submit to carriers who require it. From policy, select Actions, and Change Request. 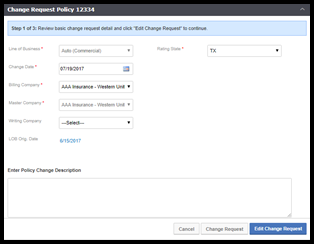 In the Change Request modal, specify the change date – the effective date of the change request – and add remarks about the change request. Be sure to leverage this remarks section because it pre-fills the ACORD 175 for commercial lines, as well as the change request memo. Seamlessly create the change request using the Step By Step alert throughout the process. Click Edit Change Request to proceed. Make the changes in the policy entry screen. 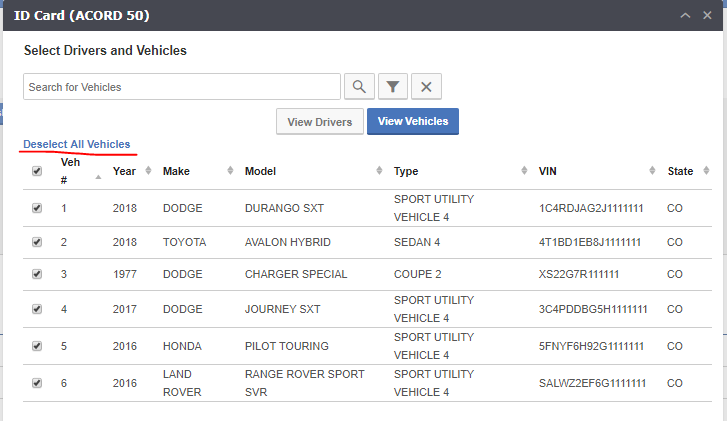 For example, if you want to add vehicles for a Commercial Auto Policy, click on Vehicles tab and add vehicles. Once you add a vehicle, click Preview to preview changes. Verify the vehicle was added as expected, ensure all details are present, and click Save & Close to be directed to Review Change Request Screen. 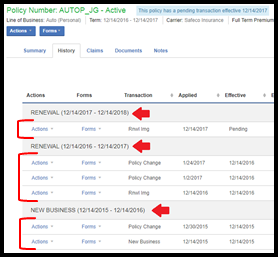 The created change request is located under the policy’s History tab and is highlighted to distinguish itself from other policy transactions. For manual policies: after receiving confirmation from carrier that the changes have been processed, click Confirm Change, enter the Change Premium, and click Change & Edit Policy to save the changes. The change request is now converted to a policy change transaction. For downloaded policies: the carrier will send the policy change download. Optional: click Confirm Change, and policy compare opens for you to compare the change request against the downloaded policy change. If the carrier sent all requested changes, you will not see any differences. Click Confirm Change to remove the change request from the History screen. If you do not want to confirm the change request, close the compare screen to return to the History page. 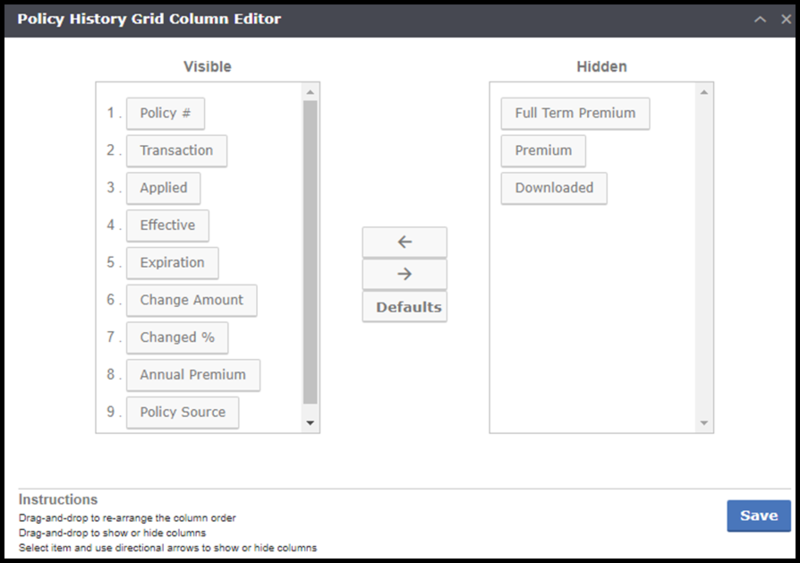 EZLynx is excited to introduce a feature that allows users to view a policy summary as of any date and for any transaction for a policy. Ability to view the policy summary at any particular point in time. View policy summary for future pending transactions. You will notice a new dropdown that enables you to select any transaction for the policy. 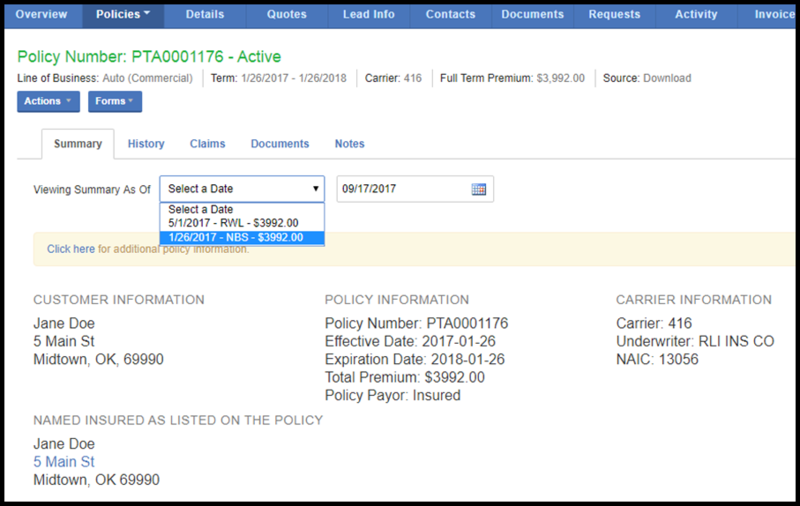 Select any historical transaction to view the policy summary. You can also view the summary for future dated transactions. 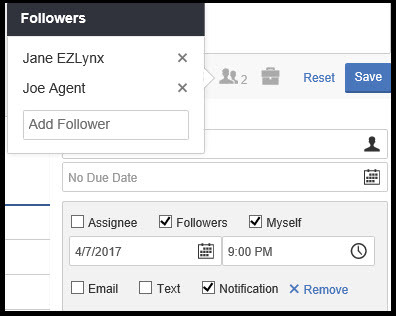 EZLynx is excited to announce enhancements to the Policy Management system that grant you greater control over your agency’s book of business. We understand that not all policies you receive from carriers are new business. Sometimes carriers consider policies as new business, for what the agency looks at as existing business. This causes issues with commissions in your agency. 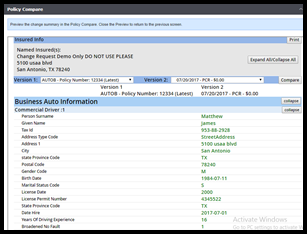 With the Rewritten Policy enhancements we are giving you better control for how you want policies listed in your agency. This provides you with a more accurate book of business and improved commission tracking. Let’s start by defining a ‘rewritten policy’ in EZLynx. If you have a customer that wants a better auto policy rate, you shop that customer around to other carriers. Once you find a carrier with a better rate, you cancel the current policy and create a new one. In EZLynx, we consider this new policy a rewritten policy. The customer is the same and the LOB is the same. The only difference is the carrier, but the new carrier sees the policy as new business. To your agency its existing business. And of course existing business pays a different commission rate. This enhancement allows you to better manage these events, and gives you greater control over your book of business and commissions. One of the first things you might notice is the ‘Term’ grouping feature to a policy’s history. The terms are in yearly increments. All transactions during that respective yearly term are grouped accordingly. Terms can be collapsed or expanded as needed using the arrow to the far right of each term. This provides a clearer picture of what is happening during the life of a policy. Being able to truly understand the relationship between two policies and their historical significance is important when trying to manage your book of business. With this round of enhancements we have provided a clear understanding of the relationship between prior and rewritten policies. For this reason, a new option is available when creating a rewritten policy. Now you can choose which policy was rewritten. Select the prior policy from the Rewrite Of This information is then added to the history of each policy. The default transaction type is Rewrite. The Effective & Expiration Dates, and LOB Origination Date pre-fill based on the prior policy. Each policy’s History screen contains a View Policy link for quick referencing. To ensure you pay the intended commission amounts for the correct policy transaction type, you can select Rewrite from the Term dropdown when creating a commission rule. When converting an application to a policy, you can now select which policy was rewritten. We encourage you apply this new functionality to your existing policy creation workflows. We have added new functionality to the Policy Transactions page to help identify potential rewrite transactions. When a policy transaction is matched to an applicant, the system looks to see if the downloaded policy is a potential rewrite. You have the option to confirm whether it is a rewrite or not. Coming soon! A new Policy Management report called Potential Rewrite Detail. This report allows you to view details on all potential rewritten policies. In the report you are able to view the policy number, which contains a link to the policy, for the policy transaction in question as well as the policy number for the potential match. EZLynx is prepared for the new state minimum limit requirements for 2018 for Delaware, Connecticut, and Kentucky. Options 20/40 and 25/25 will be removed from BI field. Options 10,000 and 15,000 will be removed from PD field. Delaware, effective January 1, 2018. New limits will be 25/50 for Bodily Injury. Options 15/30 and 25/25 will be removed from BI field. Kentucky, effective January 1, 2018. New limits will be 25,000 for Property Damage (PD). With this release we are excited to announce sweeping changes to Sales Center. Sales Center 2.0 has an improved UI providing a clear view of the opportunities in your pipeline, as well as a redesigned detail view for each opportunity. We have also added amazing functionality designed to streamline your workflows in Sales Center. These enhancements will make managing your opportunities a breeze. But wait, there’s more to come! This is the first of two Sales Center 2.0 releases that greatly improve your experience with our pipeline management system. A new icon was added to expand an opportunity. Next to the Estimated Value column you will see two arrows pointing in opposite directions. 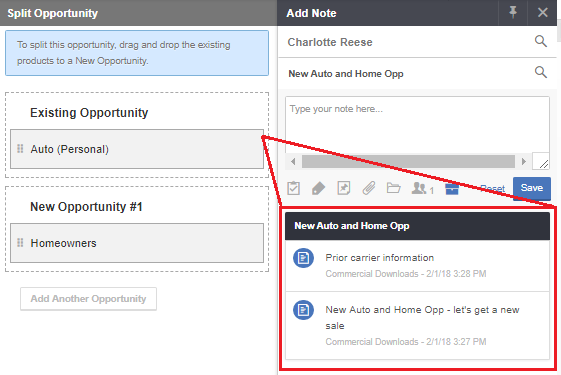 Click this to launch the new Opportunity Detail view. You can also click anywhere on the opportunity line to launch the new Opportunity Detail View. The new arrow style headers function the same way as the ‘tabs’ did in the prior Sales Center UI. However, in Sales Center 2.0 we have made the headers larger and easier to see information. Sales Priority replaces Probability of Sale and introduces a simple to interpret ‘star’ rating system. Now it’s easier to identify the importance of a sale versus the old High, Medium, and Low rating options. Filter by priority to better focus your attention on important sales opportunities. Last Contacted helps to see how long it has been since an opportunity was last touched. So what does ‘last touched’ mean? How are we configuring this number for you? Let’s take a look below. The system then applies this information to the Last Contacted column, allowing you to visually see how long it has been since interacting with an opportunity. You can also better set urgency to prioritize your day. 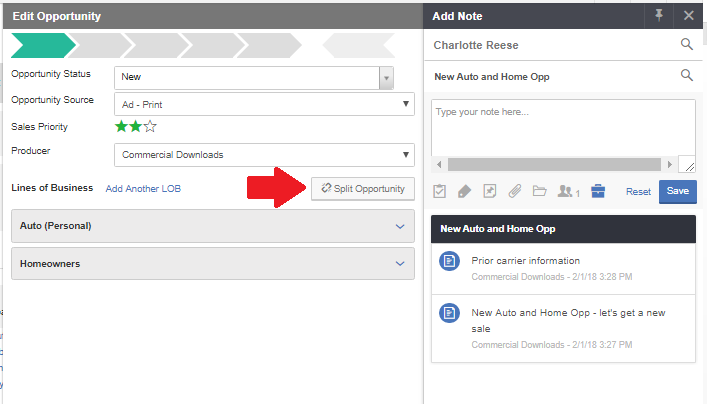 The new opportunity detail view replaces the prior expanded opportunity dropdown that appeared under each opportunity line. This information now has its own page, making it easier for you to see important information. Click on the double arrow icon. Click anywhere in the white space of that opportunity’s line. 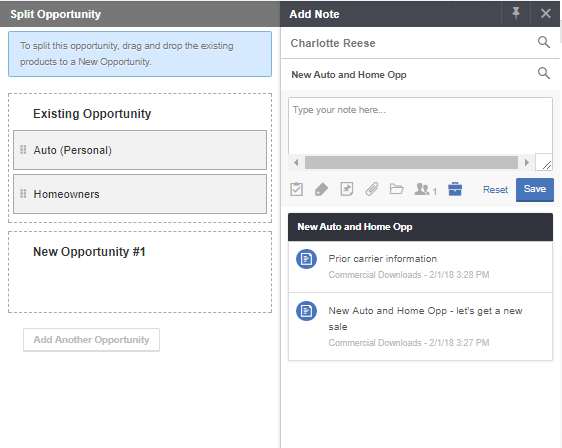 Either action launches the new Opportunity Detail View. New headers are now under the applicant’s name. Please note: Space is limited, so only the first two carriers appear in the Carrier field. Hover over the carriers for a tooltip that shows the remaining carriers making up the quote. If the LOB carrier/premium has been finalized, then only one carrier appears. You can now add manual quotes to your respective LOB on the Line of Business tab, in addition to EZLynx Rating Engine quotes. 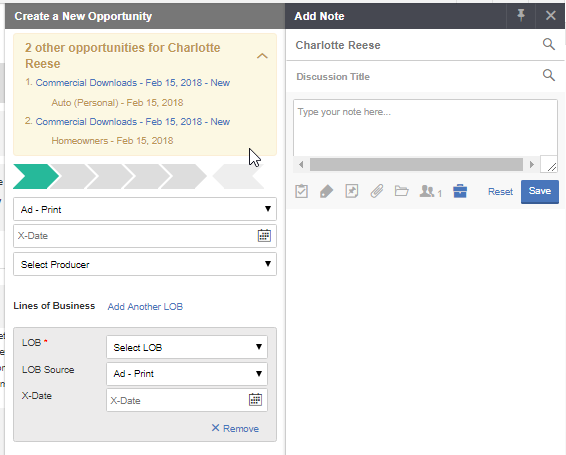 In Sales Center 2.0 you can do all of your quoting directly from the Line of Business tab, and the results automatically associate to the opportunity. 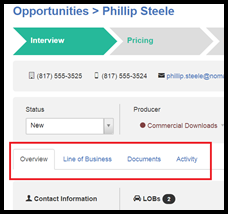 Now, the Documents tab is available regardless of where your opportunity is in the sales pipeline. You can also send and view eSignature envelopes. The Activity tab allows you to view opportunity activities, general activities for the applicant and system log events. These sub-tabs allow you to stay up-to-date on all activities associated with the applicant and their opportunity. Sales Center 2.0 further streamlines your workflow with automatic opportunity creation at the same time you create a new personal or commercial applicant. 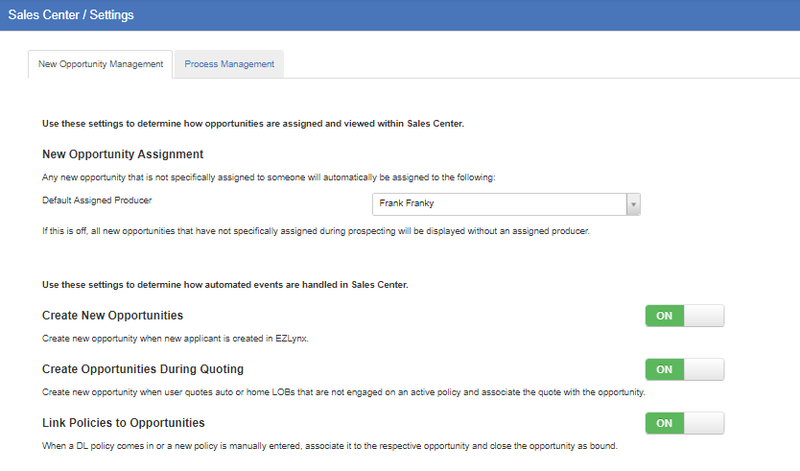 In the next release, you can look forward to automatic quote and policy association to opportunities in Sales Center, the ability to split opportunities with more than one LOB, and a new UI for opportunity management in the workspace. We are excited about the new features coming for Sales Center 2.0 and cannot wait to get them all in your hands. This release contains new enhancements for the EZLynx Accounting application aimed to simplify your interface and fix general bugs. Now, when you process a direct bill payment and select the policy in the Add Direct Bill Payment modal, you will see this information carry over to the receipt details and printed receipt. For receipts of type Cash, the system now saves the original amount paid by the customer and any change provided. Previously, only the amount retained by the agency was saved. With this round of enhancements, you can now edit or add comments to finalized receipts in EZLynx Accounting. This launches the EDIT RECEIPT modal. Either update the current comment on the receipt or add a comment if there was none. Save your changes, and they are now reflected on the finalized receipt. 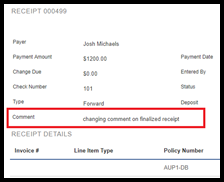 EZTIP: You can edit comments on receipts from the applicant Invoices tab and from the Receivables page in EZLynx Accounting. Along with the enhancements mentioned above, there are also several bug fixes for EZLynx Accounting in this release. These updates better refine your accounting workflows and alleviate functionality issues you are currently facing. At EZLynx, we are constantly striving to improve our product and give you a better experience. We hope these enhancements provide you with an improved workflow in the EZLynx Accounting application. Updated the posted date on checks sent to QBO to show the date posted rather than the payment date. Updated the check description field in QBO to now show the bank account and check number if there is no check memo. Fixed scrolling and screen size issues on the applicant Invoices tab when adding a DB payment. Hiding exported ‘column’ and exported ‘field’ when QB application is set for ‘Online Webservices’ for following areas: Check List, Check Overview, Add Check popup and Edit Check popup. This field is not used for the direct QBO interface. Updated the Pay Invoice action to include receipts from the parent branch in addition to the invoice’s branch. Updated the Overdue Invoice list to show receipts for an applicant if receipts are created at another branch. Including Finance Companies on direct bill payment screens. Updated receivable write-offs unapplied to now include negative amounts. Fixed error with selected line items not saving on adjustments. Fixed issue related to disabled users still appearing in accounting. Fixed issue with DB Payments having the wrong payee in some cases when a policy was not selected. Fixed issue related to installment invoices having incorrect line items if there are more the one producer. Updated printed statements to show invoices from other branches. Issue resolved where certain users would see an object error when saving sent emails. Corrected a bug where task due dates would default to 12/31/1969. 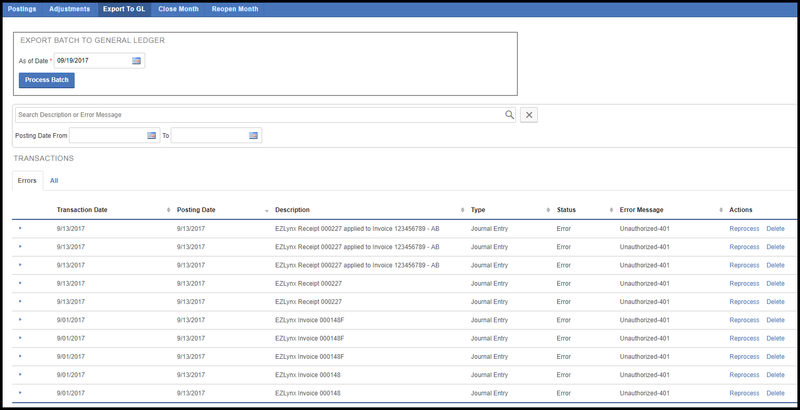 Improved the audit trail in System Log for tracking applicant detail changes. Several workflow enhancements for Manual Quotes. Improved the Agency Form Templates handling of checkboxes. Enhanced how documents associated to a policy transfer if a policy is moved to a different applicant. Users can now retroactively cancel an expired policy. Fixed an issue where the email footer buttons were hidden in certain browsers. Improved Email Subscription Management feature. Improved support for EMC Insurance Company when using EZPlugin for Chrome. Added duplicate check for Commercial Applicants. Improved LexisNexis pre-fill when creating applicants. Fixed issue where text message notifications weren’t received if mobile # was associated to multiple applicants. Commission Rules – Fixed an issue where certain users had the Agency Code field matching to rules rather than Producer Code. Auto Commercial & Personal now have an Excluded Drivers section. Auto Commercial now has a Fleet # option on Vehicles screen. 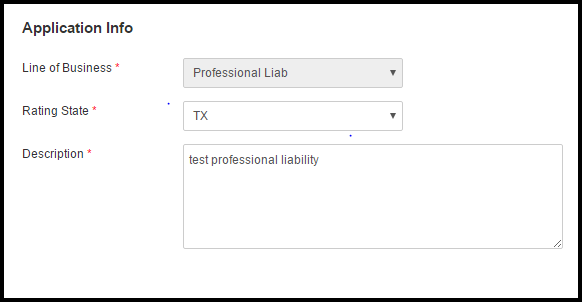 Expanded class description field for commercial general liability. Worker’s Comp Part 1 & Part 3 – users can now add more than 10 states for every rating state except Florida. Part 1 for Florida only displays FL, but Part 3 allows more than 10 states. Auto Personal – there is now the option to add premiums per vehicle. Improved Lead Source handling across branches. With the 4.17.09 release, some of our most highly requested reporting features will be here soon! Several New Reports are Coming Soon! In all reports, the Policy Number &/or Commission Statement Number columns are now links that take you directly to the Policy Details or Commission Statement Details Pages. The ability to Exclude Pending Renewals from the Policy Expiration Detail report is on its way! The Policy Expiration Detail report has a new checkbox to “Hide Pending Renewals” this will be checked by default. We have also added the following new columns: Renewal Effective Date, Renewal Premium, Renewal Premium Change Amount, & Renewal Premium Change Percent. We have removed some of the task specific information from the Activity Summary report and split it out into its own report in order to provide more details. 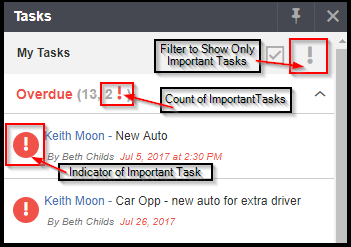 The new Task Summary report can be used to see a summary of all tasks over time, those frequently rescheduled, the overall percent past due, and much more! Use this report to view all commissions aggregated by several popular grouping categories – including Producer or Carrier – and filtered by Date Range, Carrier, Branch, Assigned Agent, Producer, Transaction Type, and more! View a summary of all of your current change requests including the number currently open and average number of days to complete, all by Agent, LOB, Master Company, and more! We are excited to announce web services for Sales Center. This allows agencies to integrate your systems with Sales Center like never before. Imagine pushing leads from a third party vendor directly into prospecting or creating opportunities for Sales Center. If you are interested in learning more about the full functionality, please contact Crista Davis at [email protected]. At EZLynx, customer feedback drives the improvements we work to provide in our monthly releases, and this month’s release responds to agent requests with respect to policies. With this release, we are excited to announce a feature that lets you view the policy summary for all transactions associated to a policy. You can also select any date to view the policy snapshot at that point of time. With this release, we are introducing the ability to view deleted transactions and access the policy forms for the deleted transactions. Upon selecting the option, you will be able to see all the deleted transactions for the policy. In the Policy History tab, you will notice the “Edit Columns” feature. All the existing policy transaction columns will be present in the Visible section. 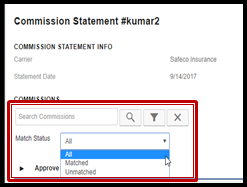 Difficulty with separating the matched and unmatched line items in your commission statements is now a thing of the past. A new filter dropdown now allows you to filter the commission line items by either: All, Matched or Unmatched. This project allows EZLynx to expand our download model by mapping sub lines of business. In addition, we take care to preserve and maintain your selected line of business choice throughout the policy history. The automatic matching process recognizes the Homeowners policy, and automatically matches to your manually entered Renters policy. We have continued to make improvements to the direct integration with QuickBooks Online. Click here for the QuickBooks Online Interface Guide. Please contact [email protected] if you would like assistance with this feature. Notice that if there are errors in exporting, you now have the option to view what the error was and REPROCESS if you choose to. Navigate to the CONFIGURATION area of accounting. Then the SYSTEM SETTINGS tab. Once there, you will notice a new option called EXPORT BY CLASSIFICATION. Department: the QuickBooks Class will be the department name for transactions that include the department, such as postings to Income accounts. The department can be defined based on line of business in the Manage LOB area of Settings. 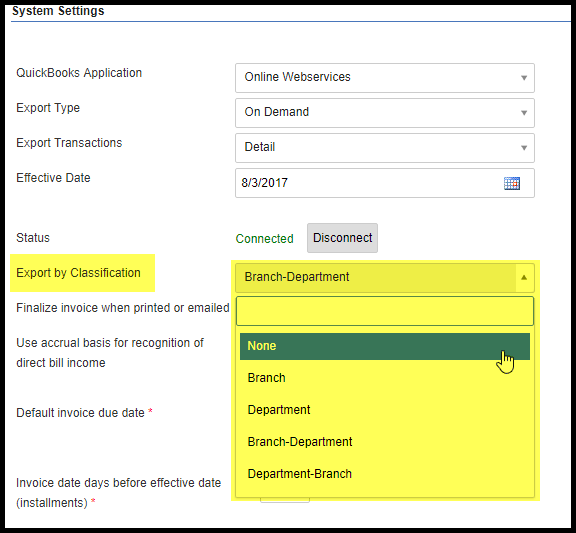 Branch-Department: the QuickBooks Class will be the branch name followed by the department name, separated by a hyphen. Department-Branch: the QuickBooks Class will be the department name followed by the branch name, separated by a hyphen. For QuickBooks Online, we have also added a new EXPORT TYPE called DAILY. This allows you to automatically schedule daily exports to QBO from EZLynx. When the DAILY export type has been select, you do not need to manually export your transactions each day. 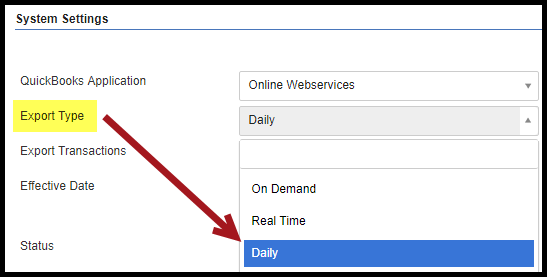 If Daily is selected, a scheduled process automatically posts all queued transactions for the org at 10:00 pm CT. Automatically reprocess transactions that fail due to intermittent issues on the QuickBooks servers. If a transaction fails because the QuickBooks servers are unavailable, EZLynx will automatically attempt to post the transaction again, up to five times. If it still fails, you can always reprocess it manually as described above. You can now select the branch when adding a Direct Bill Payment. If a direct bill payment was entered for a receipt in a different branch, you can now unapply the receipt detail even if you aren’t a user in that branch. Note: you must still have Accounting permission to the branch. If you create a check in your parent organization, you can now select line item details from any branches. Revised the account types for receivable and payable accounts. In order to eliminate issues with QuickBooks falsely reporting that there were open invoices or creating extra postings to an Unapplied Cash Bill Payment Expense account, we have revised the account types of GL Accounts created in new QuickBooks installations. Any EZLynx receivable accounts will be created as Other Current Assets accounts in QuickBooks. Any EZLynx payable accounts will be created as Other Current Liabilities accounts. You will still be able to report on these accounts as desired. If you have already enabled the QBO direct interface and are experiencing these issues, please contact [email protected] for assistance. We have implemented some back-end performance improvements to speed up the transmission of data to QuickBooks. This will provide you with greater efficiency when interacting with QBO and EZLynx. Bank transactions will now be sent to QBO as individual transactions to facilitate bank reconciliation. Resolved issues with transactions failing if the payee name or branch name included a colon. Checks with a negative total will now be sent as journal entries rather than giving an error. If you change your export from On Demand to Real Time, it will immediately send all queued transactions. We also resolved issue with creating transactions for Finance Company payees. Finally, we have made improvements for receipt reversals and posting dates. Receipt reversal will be posted with original’s transaction date, unless it is in a closed accounting period. If that date is in a closed accounting period, then the transaction date will be today. Scroll down to learn more or donate. The 4.17.08 release is packed with many valuable enhancements and streamlined workflows. At EZLynx, customer feedback drives the improvements we work to provide in our monthly releases, and this month’s release responds to many agent requests. With this release we are excited to announce a new highly requested feature for EZLynx. With EZLynx Automation Center you can now enable automated rules for your agency and sub-agencies. When triggered, these rules fire off actions like creating notes or tasks, sending emails to applicants, and closing sales center opportunities. This is just the first of many new features coming to EZLynx that will change the way you interact with the system. To access, hover over EZLynx Settings, and click Automation Center to land on the Overview page. Here you can perform a variety of functions. Click here to access more detailed information about Automation Center. To setup your agency with beta features, complete the Beta Request Form. With the new Agency Workspace enhancements, Tasks can be marked as important (can be toggled on or off) and you can now set a time for a task to be completed by. 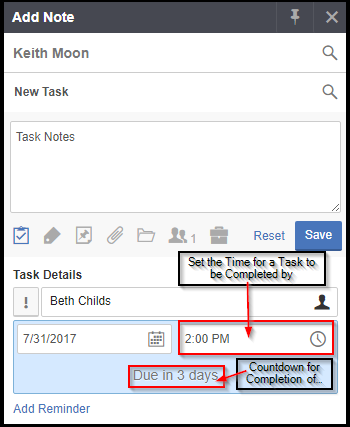 We have also added some new mobile functionality for task due date and time as well as task importance. To access, open the agency workspace to perform a variety of functions for your tasks. Mark a task as Important using the new Important icon when you create a task. The task list in the Agency Workspace now indicates the number of overall tasks within the category, as well as the number of Important tasks within the category. Set a Time the task is due, in addition to the Due Date. Click here to access more detailed information about Sales Center. With this release, we have completely revamped how you manage eSignature envelopes within EZLynx. To access, hover over EZLynx Dashboard icon, and locate eSignature box. 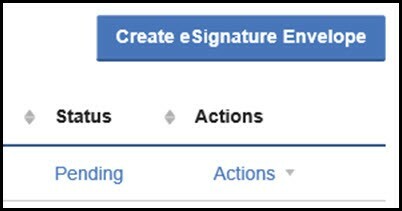 Click any status link to navigate to eSignature Manager screen. Send on behalf of another user in your agency. Quickly pre-fill email addresses for all applicants and contacts within the applicant account. Sort by Date Created, Last Modified, or Document Name when selecting documents to add to envelope. 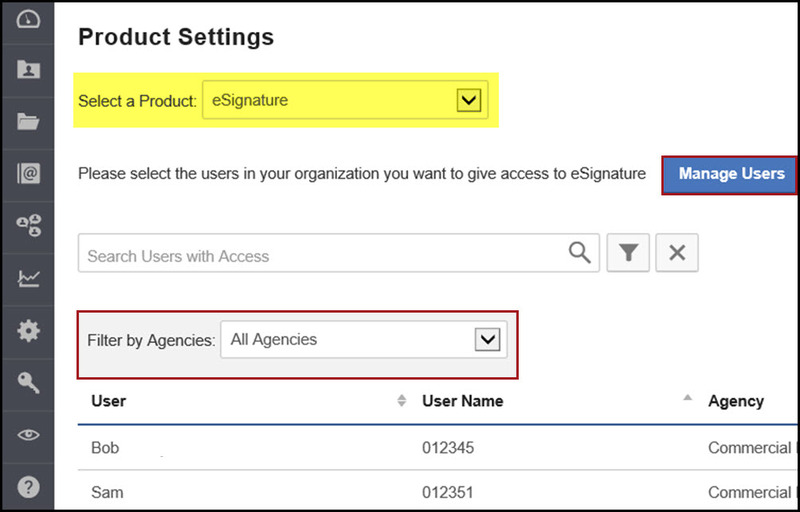 Agency admins now have a simpler way to manage product specific permissions including, eSignature & LexisNexis. To access, hover over EZLynx Settings icon, and click Product Settings link. Note: If you don’t see this option, contact EZLynx Support to confirm your permission levels. 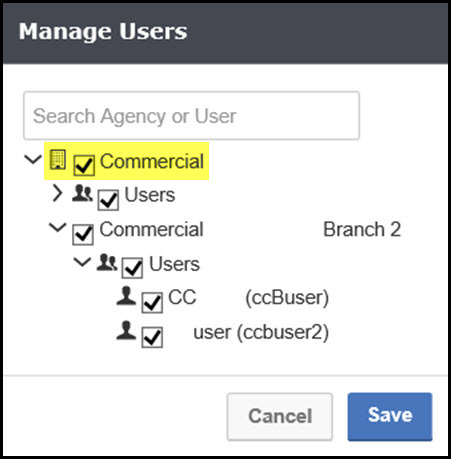 Select Manage Users to enable/disable users/branches with a few clicks. Note: If the top agency is checked, all users/branches below are selected automatically. In addition, new users/branches will automatically have access to the product. 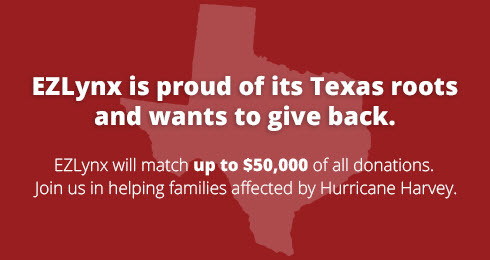 Click here to learn more about our commitment to helping those affected by Hurricane Harvey. The 4.17.07 release is a mega-release, packed with many valuable enhancements and streamlined workflows. At EZLynx, customer feedback drives the improvements we work to provide in our monthly releases, and this month’s release responds to many agent requests. Interested in BETA testing? Click HERE. We want to create a service in EZLynx that can be used by any application for the purposes of printing and mailing material on behalf of the user. This service would use a third party provider’s API to facilitate this. From a billing standpoint, this would be a pay-per-use service in most cases. Similar to other transactional features we offer, we would require flexibility in how we allocate usage, on a per-org and per-feature basis. Click HERE to learn more! Click Here to request Beta access. This great feature allows users to enter much more commercial policy information that is then pre-filled into all ACORD forms created for the policy in EZLynx. Our export to Excel feature has undergone an overhaul. For those of you exporting large amounts of data, you should now see exponentially faster download speeds when exporting to Excel. Many of our reports provide the ability to save your filter settings. With the Report Saving and Sharing feature you only need to set up a report once to easily provide access to that report for yourself &/or others at a later date. Click here to learn more about the new workflow for Saving & Sharing Reports. Drill Through Reporting offers tools that allow you to click on various sections of a summary report chart or table to drill through and view the details that make up that visualization. Click here for our Drill Through Reporting Guide. The customizable reporting Dashboard allows users to organize charts and tables from any reporting category all in one place. Each user’s Dashboard is made up of “panels”, which can be added, removed, rearranged, or renamed. 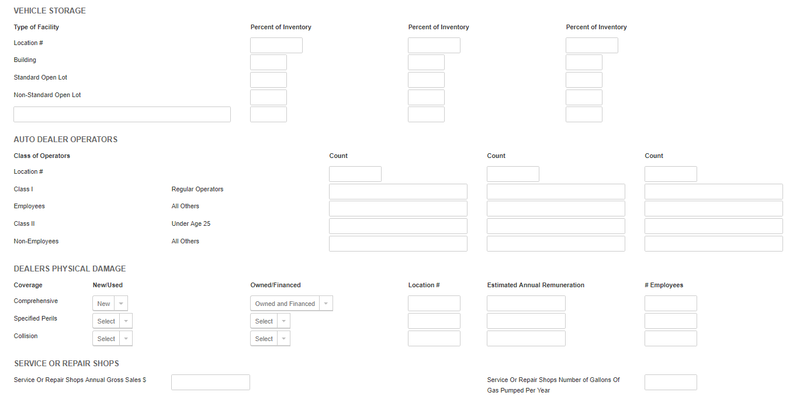 Dashboards can also be configured to have one or many tabs with varying column layouts. Click here to learn more! Crosstabs (aka Pivot Tables) and Formulas available in Master Reports – As soon as you open a Master Report you will see these two new options enabled Click here to get more details! Report Emailing and Scheduling offers tools that allow you to distribute reports from within EZLynx. These tools include the option to email a current report now, set a future time to email a report or set up an automatic, reoccurring email for reports. View our guidebook here. EZLynx is excited to announce some changes for Client Center. This round of enhancements now allows for Client Center to support Organizations with branches in EZLynx. The primary change you will notice is the new ability to have your agency Client Center shared down your organizational hierarchy with your sub-agencies. If you are at the main office, and you have permission, then you can choose to share your Client Center with your sub-agencies. To do this, simply navigate to the Settings area on the side panel and select Client Center. Also, if you are at the main office and sharing your Client Center with a sub-agency who has their own CQ (consumer quoting portal), then the branding information for that specific sub-agency will be displayed to the applicant. However, if you are at the main agency and sharing your Client Center with a sub-agency who does, not have a CQ (consumer quoting portal) configured, then the branding information of the Main agency will be displayed to the applicant. We recently released branch support for the workspace, and now we are transferring that same great functionality to your mobile device. 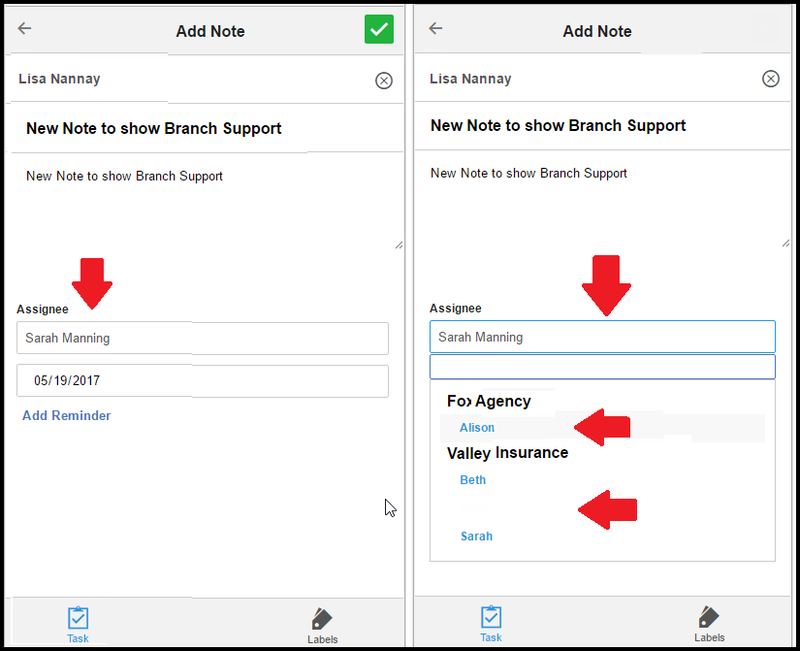 For agencies with branch support enabled, you will notice you are now able to select who in your organization will receive reminders for tasks. Agencies without branches will now be able to select who in your organization will receive reminders for tasks and see greater sorting for labels in EZLynx. Once branch support has been enabled you will now see a new grouping function in the Task Assignee drop down in mobile. This will now be showing you the users who have access to the selected applicant. 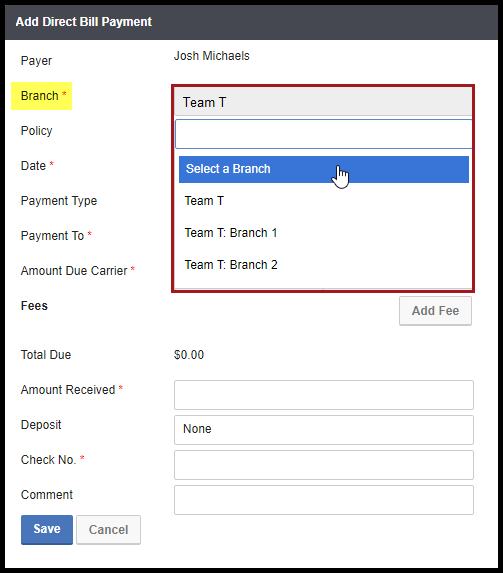 This will help with assigning tasks to agents in different branches in your organization. Retail Agencies and Branches will now be able to control who sent the reminders for tasks. You can select all three options or one. Agencies will also have the ability to edit the reminders when reviewing the applicant’s task in mobile. Simply locate the applicant with the task to edit and click the ‘Edit Task’ option. This will open the current task and allow you to edit and create notes for the task, as well as edit the reminder you had previously entered. With the upcoming release, we focused primarily on the Rating Engine including a major update to managing customer phone #’s! We listened to your feedback, and have removed the requirement to have a “Home” phone # attached to a customer for rating purposes. You can now add phones as needed to a customer, and rates will still succeed as long as one phone # exists! “Water Back-up” endorsements have new options of $15,000 and $20,000. State Minimum coverage for “BI” and “Property Damage” has been changed to 15/30 and $25,000. Options 10/20 will be removed from Bodily Injury, Uninsured Motorist and Underinsured Motorist fields. Options $10,000 and $15,000 will be removed from PD field. Indiana: State Minimum coverage for “Property Damage” has been changed to $25,000 effective July 1, 2017. Options $10,000 and $15,000 will be removed from PD field for applications created with effective date as July 1, 2017 & beyond. Added support for 2018 vehicles. With the upcoming release, we focused on improving communications and workflow between the main office and their branch offices. We have combined Carrier logins, Carrier Defaults, and Quote Templates in a new section called Carrier Quoting Setup. The new section breaks out each step to take before starting the quoting process. This will help improve new users with setup and workflow. In addition, we have removed the Test button to eliminate login errors and kept “Set Logins” and “Clear Logins”. Agents can now setup logins from the Submit details page with the new Set Logins button. The Set Logins Button will allow you to set and validate the credentials without being redirected to the Carrier logins page. Agency Workspace – Reminders & Followers. We have given agency admin the ability to choose who should receive alerts in EZLynx upon incoming Text Messages. With this change, you will be able to define whether it should be everyone, only the assigned agent for the matching applicant, or perhaps specific users, such as only the CSRs, etc. This feature is not limited to branches but also be used by single location agencies as well. A parent-level agency can allow their branches to use their text messaging number. 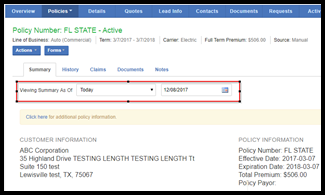 Policy Transactions page, the tooltip for the column headers has been updated to give more clarity for each column. The Application and Policy Entry Screens have been updated for Commercial Auto, Inland Marine, Business Owners lines of business. Commercial Auto lines of business, additional fields have been included for the state of Florida. 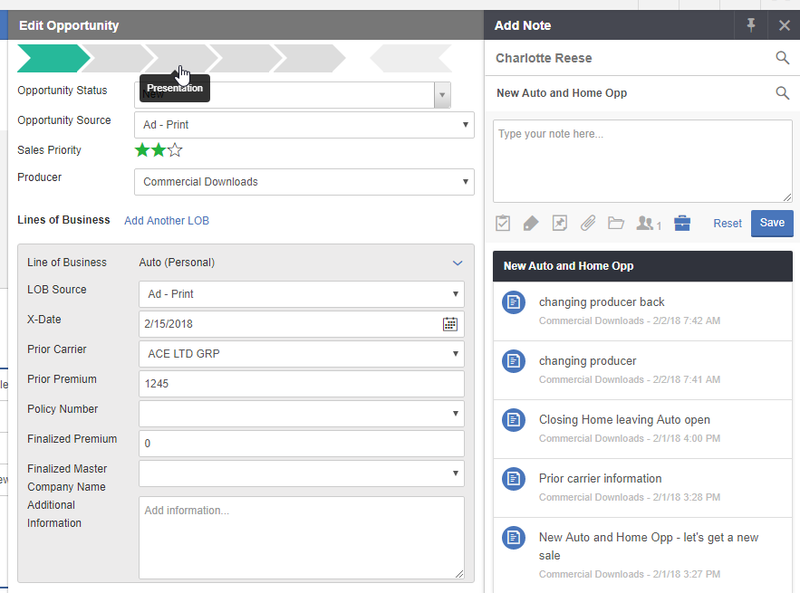 Business Owners lines of business, Garage Keepers Liability section’s User Interface has been updated to help users while they create an application, manual policies.